The Grand Central was Eureka Springs first brick hotel; built in 1880. In its heyday the Grand Central Hotel received well-to-do visitors from the East who made the journey to discover the healing waters of Eureka Springs. Water from Onyx Spring was piped down from East Mountain to provide running spring water to every floor of the Grand Central. It was a bustling hotel until a major fire near the end of the nineteenth century. It was then that the hotel began a steady decline. The lobby of the Grand Central Hotel is echos the elegance of the 19th century and still offers all of the modern conveniences. In 1985, the Grand Central was completely renovated and reborn. Today the hotel features a Grand Ballroom (perfect for weddings), a beautiful lobby that features local art work and all the modern conveniences that today’s traveler expects. Located on North Main Street, the Grand Central is in Eureka Springs burgeoning art district. It is the perfect location to explore art galleries, watch local artists at work in an active art colony and shop for one-of-a-kind treasures crafted by a local Eureka Springs artist. The Grand Central Hotel is also home to the Grand Taverne and a fabulous Eureka Springs spa and salon. Learn more about Downtown Eureka Springs . Take a virtual tour of Grand Central Hotel. 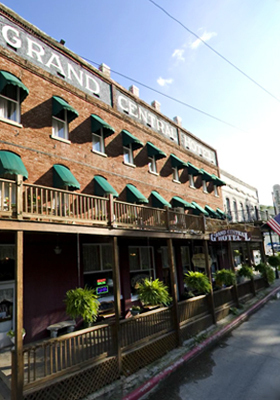 The Grand Central Hotel is located near the “artistic” part of downtown Eureka Springs. Discover the best Eureka Springs lodging, Eureka Springs dining, Eureka Springs shopping and entertainment on the Official website for the Greater Eureka Springs Region, EurekaSprings.com. This entry was posted on May 8, 2012 by estcblog in Eureka Springs Lodging, Fun Downtown, History, Shopping, Things to Do and tagged downtown, Eureka Springs, historic downtown, historic hotels.